Here’s the synopsis! Find the first chapter below! Patrick and Sissy Hughes are on the run, fleeing their father’s murderer. They carry with them a wooden box retrieved from a secret compartment beneath their father’s bed. His dying words to them: “keep it safe, keep it hidden.” Powerful men are looking for what’s inside, and they will do anything they can to get it. 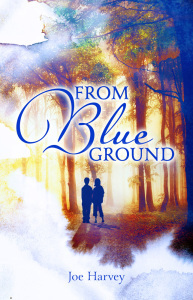 Patrick and Sissy’s only hope is to unlock the mystery of the contents of the box: a diary, a translucent blue stone, and a bag of blue ground. That hope lies in Philadelphia with Henry Carvill Lewis, a professor of mineralogy at the Academy of Natural Sciences. As they make their way to Philadelphia, their pursuers grow in numbers and Patrick and Sissy must fight against time and the odds to stay together—and alive. Pin pricks of light shined through the stone foundation on the far wall. He crawled toward them and grasped at the stones trying to pry one loose. He dug at the dirt mortar with his fingernails creating a small hole then pulled out a large stone the size of his face.